The Literacy and Numeracy across East Africa report by Uwezo seeks to explain whether children are learning. The report reveals that very few children enrolled in grade 3 (aged 9 and 10) can pass the individual literacy and numeracy tests. The outcome is that the majority are not acquiring basic competencies in their early schooling years. Despite efforts to expand access to primary schooling with the aim of attaining the universal primary education goal, education indicators remain deficient across the East African region. All countries in the region have a ratio of over 45 pupils per teacher. In order to make achieving the goal a reality, vulnerable children (orphans, children with disabilities and those engaged in child labour) need to be targeted for enrolment and retention in schools. At what grade are primary school children repeating? What is the regional breakdown of the repeaters? What are the causes of school dropout among primary school children? At what grade are these children dropping out of school? At what grade are primary school children in Tanzania repeating? Repetition in schools occurs when students are held in one grade for an extra year, mainly due to academic failure but possibly also due to the inadequacy of school systems to respond to population needs. The data shows that in 2008 children in grade 4 (aged between 10 and 11) had high repetition rates with 170,000 repeaters. This may be because beyond grade 4, children in Tanzania are not allowed to repeat, unless under particular circumstances, such as illness.Furthermore, children in grade 4 are expected to take a national exam and if exam performance is unsatisfactory there is a higher likelihood of grade repetition. 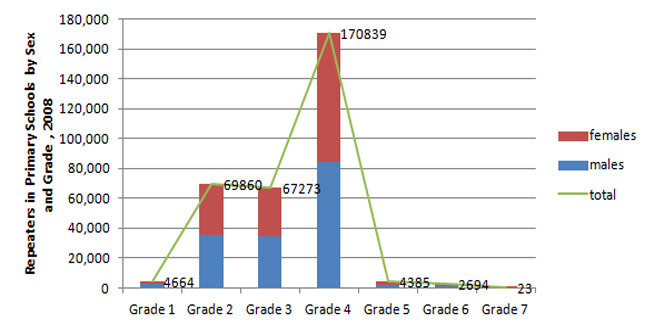 The number of children repeating grade 6 in 2008 (aged 12 and 13) was 2,694, while 67,273 repeat grade 3. The regions of Mwanza (25,476) and Shinyanga (24,892) contributed the highest number of grade 4 repeaters. When a repeater-to-enrolment proportion is calculated, Kigoma region had the highest proportion, with 23% of the children enrolled in grade 4 repeating. Why are Tanzanian children dropping out of primary school? Note: Data used is for government primary schools. Source: Development Initiatives based on Tanzania BEST data. 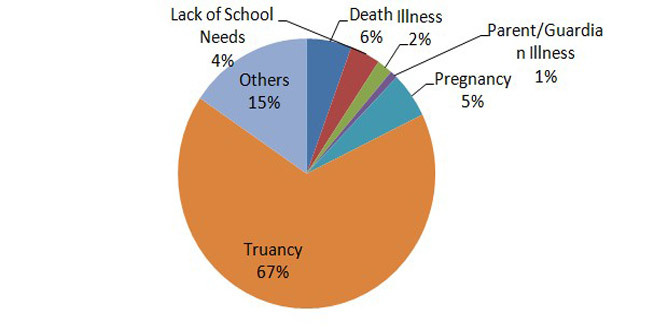 Truancy accounted for 67% of the primary school dropout cases in 2008. Truancy is a social problem which may arise from cases of bullying, drug abuse or violence, and is also an indicator of the amount of time parents spend supervising their children. The highest dropout rate (22%) can be found amongst grade 4 pupils, with more than half of the total dropout occurring between grade 1 and grade 4. There are often clear indicators associated with children who drop out of school which include grade repetition, low achievement, being an over-age enroller and school absenteeism. This may explain why both school drop outs and repetition occur mainly in grade 4. Learning challenges are not limited to grade 3, the area explored by the Uwezo report. Grade 4 children in Tanzania are also affected as the highest number of repeaters and dropouts are amongst this group. Tanzania’s national education policy dictates that pupils are allowed to repeat a grade between 1 and 4 only if they have not mastered the skills required for each grade. So are the high repeating and dropout rates in grade 4 justifiable? Many of the primary school gross enrolment ratios in East African countries are over 100%, which indicates that children being enrolled are over-age, or under-age. It also indicates that many children are repeating class. In light of the above, when we consider that 100% of teachers in Tanzania are trained to teach, it begs the question of whether the quality of the training is of a satisfactory standard. The Government of Tanzania needs to further address the causes of school dropout which include child labour, children becoming orphaned, disability and children’s access to education. You can read the full paper on Performance of primary school children in Tanzania: patterns in grade repetition and school drop-out rates here.